By Skott Butler, President, Intelsat General Corp.
Two of the Intelsat EpicNG design features often talked about are the enhanced ability to mitigate both intentional and accidental interference and the ease with which a user on the move, whether land, sea, or air, can switch from one spot beam to another as the beam crosses through the satellite’s footprint. Intelsat recently completed a round of testing that validated both of these attributes. 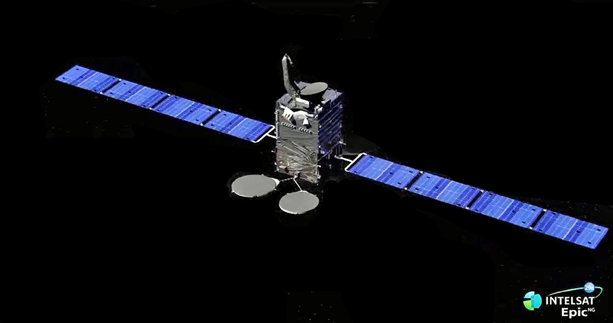 Attended by U.S. Department of Defense (DoD) observers, the first showcased the capability of the Intelsat EpicNG platform’s advanced digital payload to work around efforts to interfere or jam the signals on the first Intelsat EpicNG satellite, IS-29e. The demonstration used a remote terminal transmitting video over the satellite to a hub Earth station. During the validation process, technicians transmitted an interference signal on the same channel used to transmit the video. A fourth evaluation might have been done, but was not part of the test. The isolated interfering signal could have been delivered to a location of the customer’s choosing, which would allow them to characterize the signal to better understand the nature of the adversary. This interference mitigation capability provides a level of reliability and security that is of vital importance to our customers. This is part of the company’s overall systematic defense-in-depth approach that detects, prevents and mitigates attacks so that mission assurance is greatly enhanced. In the second test, an IS-29e was used to validate the beam-switching capabilities with General Atomics Aeronautical Systems and their Block 5 Predator B/MQ-9 platform. Beam switching is crucial for UAS to be able to fly over wide areas and maintain a connection with the satellite, both for flight operations and transmission of sensor data. The tests were performed at the General Atomics flight test facility adjacent to the Grand Forks Air Force Base in North Dakota. During the tests, the UAS flew a round trip of 1,075 nautical miles, while switching between spot beams on Intelsat IS-29e. Command-and-control was verified as well as sensor data transmissions from the aircraft multiple times in both beams. Artistic rendition of the IS-29e EpicNG satellite. In the tests, closed loop control of the aircraft had less than five seconds of outage. This was validated over multiple beam switches. Video transmission from the UAS had less than 10 seconds of outage during those beam switchovers. The additional time for the video was due to re-synching of the decoder at the receive site. To conduct the testing, the FAA granted General Atomics a waiver that authorized the Block 5 MQ-9 to fly in airspace managed by air traffic controllers without the requirement of following it with a manned airplane, which was a first for both the FAA and General Atomics. 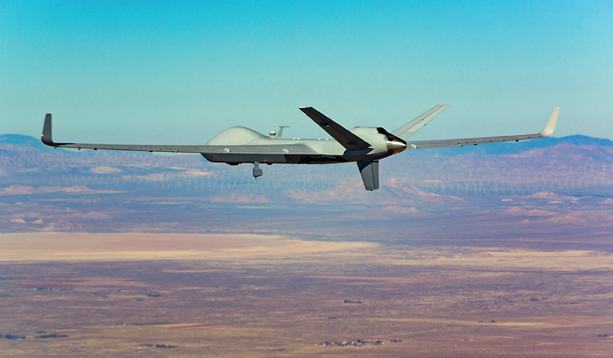 General Atomics has been developing UAS technologies for nearly 25 years and recently established a center in North Dakota to train UAS pilots and payload operators. The Predator B MQ-9 Reaper®, equipped with a fault-tolerant flight control system and triple redundant avionics system architecture. Photo is courtesy of General Atomics. 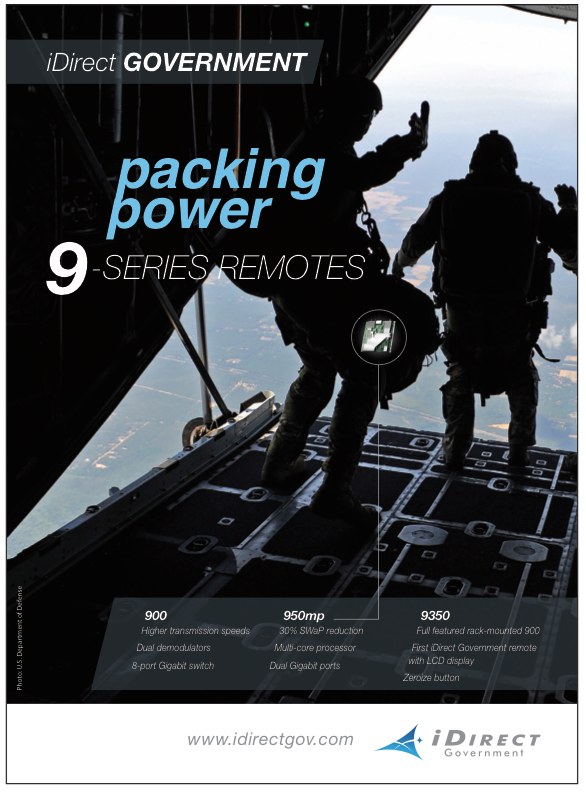 HTS platforms such as Intelsat EpicNG are larger and more powerful than any previous satellites, delivering new capabilities to the nation’s defense and other government customers. 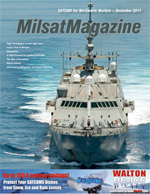 Earlier tests had already been completed by the company to establish that the Intelsat EpicNG spacecraft offer bandwidth efficiency improvements in the range of 165 percent on current networking hardware and up to 330 percent on next-generation ground networking technologies for small mobility antennas. These latest tests demonstrate the ability to work around interference and smoothly move a signal from one beam to another on the satellite to maintain contact in flight providing further proof of the value of this constellation to our government and commercial customers.